Looks like more changes are in the works for Parish. Zeb Stevenson, the chef who launched a new menu and even changed the name of Parish to The Brasserie and Neighborhood Café at Parish, is leaving the Concentrics restaurant group and Inman Park on January 11. Two days later, he’ll officially take over the kitchen at Watershed on Peachtree, where which recently lost its head chef, Joe Truex. (He’s moving to Dubai to open a pizza restaurant). 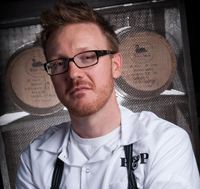 Stevenson says he’ll slowly evolve the Southern menu to reflect his commitment to locality, seasonality, and technique. Stevenson says he’ll spend his first few weeks at Watershed observing. “Whatever influence I bring and whatever changes happen are going to come organically. Watershed has a great strong history—some of that has to live on,” he says. To that regard, Stevenson will continue to serve Watershed’s famous fried chicken on Wednesday evenings, using the original Edna Lewis recipe. He’ll host wine dinners at the restaurant and aims to use them as opportunities to “stretch my legs creatively,” he says. “We’ve built our restaurant on seasonality and locality, and Zeb has some great ideas about how to stay true to those principles while making the menu even more dynamic and current, balancing comfortable and satisfying with modern influences,” Jones says. Meanwhile, the folks at Concentrics say they are committed to Parish’s new concept and are in talks with some of Atlanta’s “top talent.” They will be making an announcement soon.